Recently I had a chance to build a tool to track software dependencies across all software repositories and wanted to share some of my design thoughts on this subject as well working code of the tool. So why not use off-the-shelf tool, like NDepend? For what we wanted, it turned out to be not hard to build from scratch and plus it was fun. Assume there are multiple source control (C#) git repositories. A repository can have one solution with multiple projects or it may contain multiple solutions. Source control repositories boundaries aren't that important, but what's important and typical is that certain assemblies are shared between solutions. If that wasn't the case we could simply use Visual Studio to track them down. Higher SKU's of Visual Studio have even better dependencies visualization tools, but given just VS professional and a 100+ solutions, finding what depends on what is challenging. For example, there may be a web services solution with two projects both of which have dependency on common dll which is defined in a separate solution and shared with the first one as Nuget package or simply file references. Assume that we are talking about static compile time assembly dependencies only because dependencies can be in the form Nuget packages as well. 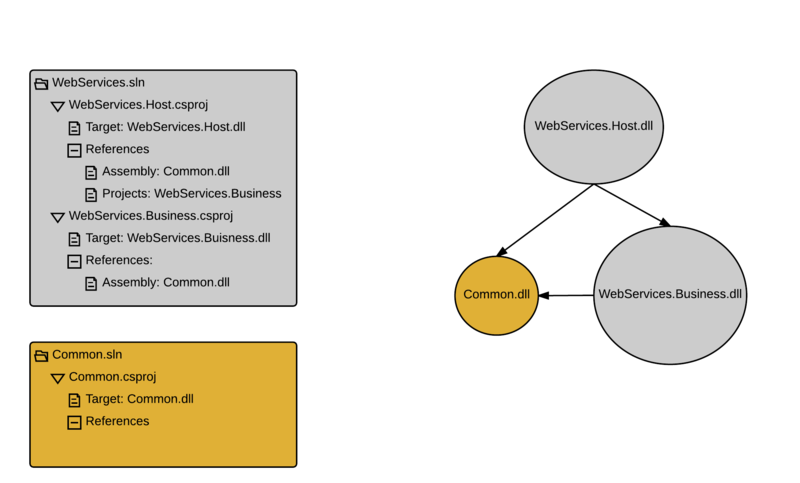 Dependencies can also be dynamic inter-process communication dependencies like web services, message queues and alike. It could be done through reflection, but I chose a combination of Roslyn and reflection because more complicated dependency tracking problems like tracking dynamic web services dependencies would be easier to solve. // Build the list of all dlls referenced by the project, both assembly(metadata) and project references. Here we exclude certain projects types and assemblies then call to OpenSolutionAsync (line 11) returns a list of projects. Just like it is in Visual Studio, each project has project and assemblies references which we combine into one list (line 31). Once we have that, we need reflection API to grab version and description attributes. In order for this code to run on the build server, the server must have Microsoft Build Tools 2015. If Visual Studio isn't installed on the build server, there should be a folder with a couple of files for build targets. These files can be copied from the machine that has Visual Studio.